Lot 274. Baktrian Kingdom. Eukratides I. Ca. 171-145 B.C. AR tetradrachm (32 mm, 16.96 g, 12 h). 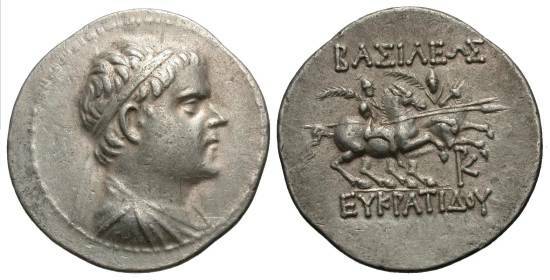 Diademed and draped bust of Eukratides I right / BAΣIΛEΩΣ EYKPATIΔOY, Dioskouroi charging right on horseback with couched spears and holding palm branches; in right field, monogram. Bopearachchi 1B; HGC 12, 130. Well struck on a nice broad flan. Well centered. Lightly toned. Extremely fine.